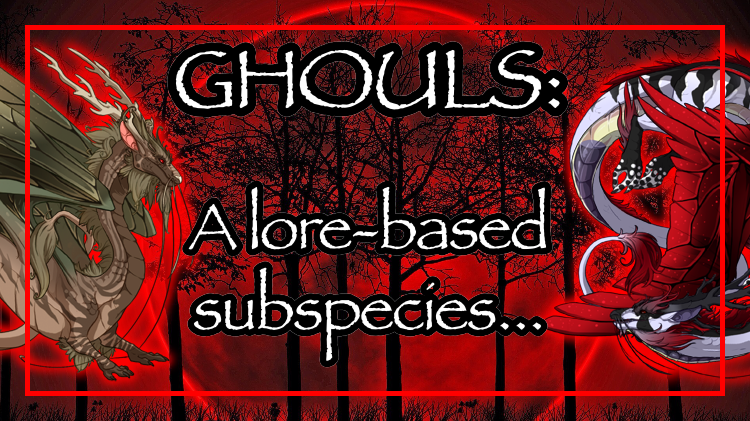 Welcome to the official Ghouls subspecies thread! 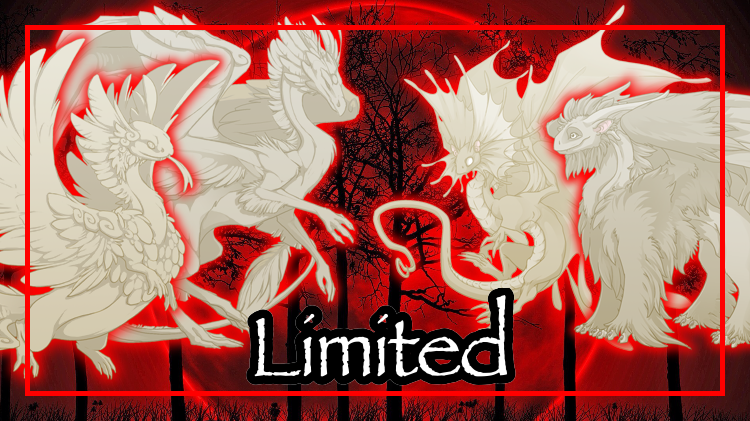 Ghouls are a lore-based subspecies; while they do have certain gene and color restrictions, on occasion I may be able to permit certain dragons that do not fit the requirements based on how ghoulish they look. The Ghouls are going to be more lore-centric than anything else. ⇒ Ghouls come in many shades and colors. However, they all share a common theme: creepy. Blacks, reds, browns, dark colors, dull colors... these are what you usually find in a Ghoul. Have a possible Ghoul that doesn't fit the requirements or that you aren't sure about? PM me with the subject "Ghouls" and we'll figure it out! As a bounty of elemental power surged across Sornieth, something else was spreading along with it. A dark energy found root in each of the eleven flights. It seeped into the steady hearts of unborn hatchlings, changing their chemistry and dulling their sentience. These hatchlings, when they emerged, were no longer pure dragons. They did not feel as the rest did; they were emotionless, and had no moral compass, seeming to take joy on the pain of others. When the clans slept, these unholy abominations would stay by the slumbering dragons, creating nightmares to feed off of. After weeks of sleepless nights and out of pure fear of the hatchlings, the clans would eventually banish them, casting them out into the dark to fend for themselves. But the hatchlings didn't care. They were Ghouls, created from the darkest energies, be it natural or dragon-made. They would never die. They did not need anyone to care for them. They could grow and learn on their own. And there was always fear to feed them. Appearance: Ghouls can be easily recognized by their dark and/or muted colors, their striped bodies, and their glittering wings. They tend to have a dark, eerie vibe about them. **Unusual Ghouls** Ghouls that don't have the striped bodies and shimmering wings of the average Ghoul are considered Unusuals. They are just as dangerous and frightening as any other Ghoul. Diet & Feeding: Ghouls will feed on plants, meat, insects, and seafood just like their dragon counterparts. However, their true nutrition lies in the fear or other creatures. A Ghoul must feed on fear in order to survive. Without fear, a Ghoul will not die, but instead wither away, losing whatever remains of their sentience and becoming mindless monsters. Social: Ghouls are either one of two extremes: extremely social or extremely independent. Some Ghouls prefer to live and hunt alone, keeping all the fear to themselves. Others find benefit in surrounding themselves with other Ghouls, as they will be able to create and harvest more fear than they could alone. If they don't live in Ghoul clans, a Ghoul may trick a normal clan into letting it live there, where it will feed off of the fear of its clanmates. Breeding: Ghouls don't necessarily need to breed, since they can be created by magic, alchemy, and other artificial sources. However, some Ghouls do find a mate and breed. These are often not permanent mates, but some Ghouls will seek out a lifemate. Communication: Ghouls typically cannot form words. They communicate through various other noises, such as clicks and growls. Ghouls are also capable of telepathic communication, though it is not often needed. It is possible to try and teach a Ghoul to speak. However, it is a long and tedious process, and requires a Ghoul that still retains some of its dragon qualities (i.e. a Ghoul with memories from its old life, a recently turned Ghoul). Hoarding: Ghouls are often found surrounded by a pile of broken and decaying items. This includes, but is not limited to: skulls, bones, broken glass/ceramics, animal hides, garbage, claws, teeth, and more. A broken bottle. Whatever it once held has been removed. Dressing: Just like what they collect, Ghouls will adorn themselves in rags and skulls. Whatever a Ghoul can find is usually included in its outfit. The goal of a Ghoul's outfit is always to up its fear factor. The scarier the outfit, the better it is. A hefty skull headdress, decorated with black tribal ribbons, threads, feathers, and beads. Wise dragons warn against the mystical and primal energies that surround pieces like this. Companionship: Ghouls prefer to keep an intimidating familiar handy. Often, these familiars have some part of their skeletal structure exposed. They add an important fear factor to the Ghoul's appearance. These familiars range from decaying monstrosities to vicious freaks. Common breeds are the most likely to be or become Ghouls. They are often, but not always, born as Ghouls opposed to other methods of creation. Nocturnes: What better dragon for a Ghoul than the offspring of Shadow? These Ghouls are often the trickiest to pin down; once they're loose, it's near impossible to stop or slow them down. Their bat-like appearance helps to trick dragons from a distance away, allowing a Ghoul to fly overhead unnoticed and drop quickly to attack. Uncommon breeds are less likely to be or become Ghouls. They are often, but not always, born as Ghouls or turned by alchemy opposed to other methods of creation. Wildclaws: With their quick feet and sharp claws, these Ghouls are a terror to Sornieth. They stalk their prey, feeding on the fear created by doubt and anxiety. They often travel in groups, working together to capture and torture dragons for their fear. Mirrors: With two sets of eyes, these Ghouls double their fear factor. They are especially good at harvesting fear from dragons. With their extra set of eyes, they can process a dragon's deepest fears. They then use these fears to their advantage, often increasing the fear they can obtain from a dragon. Guardians: Large and intimidating, these Ghouls are the most determined of the lot. Their charge is often found in a normal dragon, one with plenty of fear to keep the Ghoul strong and healthy. Scaredy-dragons beware: you don't want to have a clingy Ghoul following you for the rest of your life. Ridgebacks: A Ridgeback's sharp hide provides for the perfect defense. It's no wonder why these Ghouls tend to frighten their prey by charging at full speed. To be in the path of one of these Ghouls is a sure fright, and makes a perfect meal for them. Rare breeds are rarely able to be or become Ghouls. They are often, but not always, turned into Ghouls by alchemy or magic opposed to other methods of creation. Pearlcatchers: Only one thing is more attached to a Pearlcatcher's pearl than the dragon itself. These Ghouls get their fill of fear by stealing and keeping a pearl from their respective dragons. While in possession of it, they feed off of the fear and worry emitted from the Pearlcatcher victim. Spirals: The large eyes of a Spiral sure come in handy during the night. With their night vision, these Ghouls sneak into a dragon's den while they sleep, feeding off of nightmares and bad dreams. When they aren't dream-eating, these dragons instead wait in thick brush, creating unease with their large, reflective eyes. Limited breeds are the least likely to be or become Ghouls. They are often, but not always, turned into Ghouls through black magic opposed to other methods of creation. Skydancers: Don't let their dainty appearance fool you; these Ghouls are anything but elegant. They lure dragons deep into their homes, using the familiar turf to their advantage. 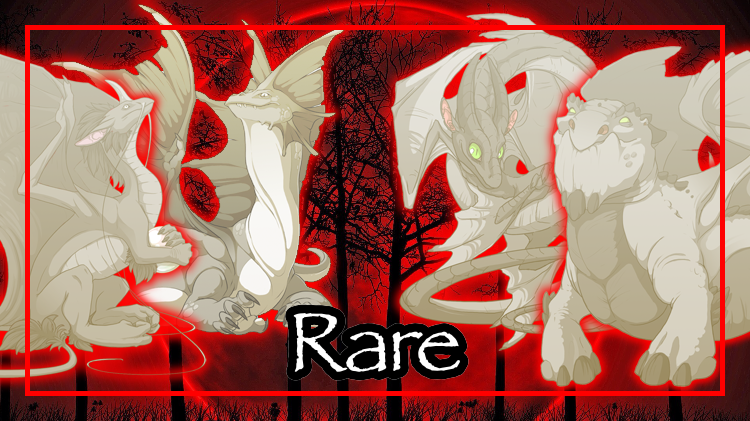 Dragons who have encountered these Ghouls can assure you that it is by no means a fun game of hide-and-seek. Coatls: With fluffy feathers and short limbs, Coatls are far from Ghoul material. However those that become Ghoul make the perfect deceivers. 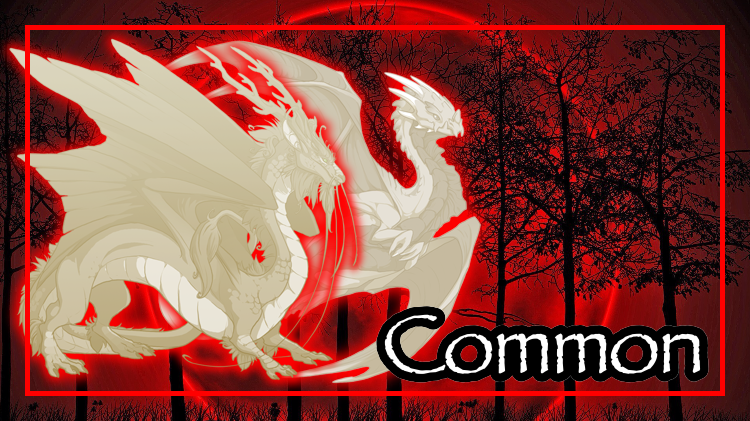 Their soft appearance and charming smiles will fool any dragon into letting them into their clans. But once they're in, look out: these Ghouls won't hesitate to inflict pain in order to create fear. Faes: Considering that the Fae are the smallest of the dragons, it's no wonder that there are barely any that become Ghouls. For those that do, they've found their own methods of attack. In swarms, they cling to a dragon's side, biting, clawing, and scratching in order to create overwhelming fear. You don't want to be on the receiving end of their attacks. Tundras: Like the Coatl, Tundras are a soft, fluffy breed. Not many would suspect them to become a Ghoul. Those that are tend to keep their distance from dragons. To get the fear they need, they instead steal it from another Ghoul's prey. These Ghouls are often a cause of conflict within the subspecies. Basic/Underbelly/Okapi/Contour/Thylacine/Stained: These genes neither help nor harm the Ghoul; no difference is observed. Circuit: Circuit is often a sign of an unnatural origin. These Ghouls may have mechanical parts, and may even be androids. They may or may not be in pain depending on how well-constructed their mechanical parts are. Crackle/Smirch: These genes are the sign of a venomous Ghoul. Crackle denotes a venomous bite. Smirch Ghouls can spit venom. And Ghouls with capsule have venomous blood. Smoke: Ghouls with smoke are often sharing a vessel with another entity. This entity can be a demon, the Shade, a spirit, or another Ghoul. Lace/Filigree/Ringlets: These three genes tell the tale of a Ghoul's previous life as royalty or high rank. Ghouls are often ashamed of these genes and will do their best to hide them. They decrease a dragon's fear factor. Scales/Opal/Gembond: These genes are physical diseases, though they don't affect a Ghoul's health. The only real issue comes with the scales gene, in which a Ghoul will shed more than average. All three genes harden a Ghoul's hide and form an armor of sorts. Ghost: A Ghoul with ghost is one of two things. It can be decaying, and as a result has its bones exposed. Or it was once the corpse of a normal dragon, resurrected and changed into a Ghoul with black magic. Neither choice is very pretty. Firefly/Runes/Glimmer: Ghouls with these genes typically have a magical origin, but whether it was good or evil that made them is unclear. They have a heightened skill in magic, but the glow of the genes greatly decreases their stealth. Spines: A Ghoul with spines is something to avoid. The sharp ridges are the result of reverting to their primal instincts. These creatures have no remaining sentience; stay away. Plague: Plague is the most common element for a Ghoul. Plague Ghouls can turn other dragons into Ghouls by feeding the dragon a Ghoul's blood. Shadow: Second to Plague is Shadow. If a Shadow Ghoul figures out a dragon's greatest fear, it can create illusions to better scare its prey. Fire: Fire Ghouls are certainly a sight to behold. Their scales can burn eternally without ever injuring the Ghoul, making these Ghouls the perfect walking bonfires. Light: While it may seem strange for Light to seem so high on the list, Light Ghouls have a surprising advantage. These Ghouls have perfected their light tricks, and can fool a dragon into seeing something that isn't there, similar to their Shadow counterparts. Ice: Ice Ghouls are a chilling bunch. They freeze dragons into place, pinning them down in order to feed on their fear. Earth: The Earth element makes for a hardy, loyal Ghoul. These Ghouls can make the ground crack and quake, trapping unsuspecting dragons in deep canyons. Arcane: Arcane Ghouls have a useful tool for catching prey. These Ghouls can teleport, making ot all the easier to catch a runaway dragon. Nature: Ghouls of the Nature flight tend to be few and far between. While they can't turn existing dragons into Ghouls like their Plague cousins, they can use bones and plants to create an army of Ghoul eggs. Water: Water Ghouls are often dark-colored to match the depths of the sea. They can manipulate the clouds and the rain, as well as the water inside of a dragon's body (ouch). Wind: While they may seem useless, Wind Ghouls have their strengths. They can create terrible storms and can fly long distances without tiring. Lightning: Seeing as the Lightning flight is loyal to their orders, Lightning Ghouls are quite rare. The Ghouls that can overcome their lightning instincts have the powerful ability to summon thunder and lightning, as well as use their bodies as conductors. 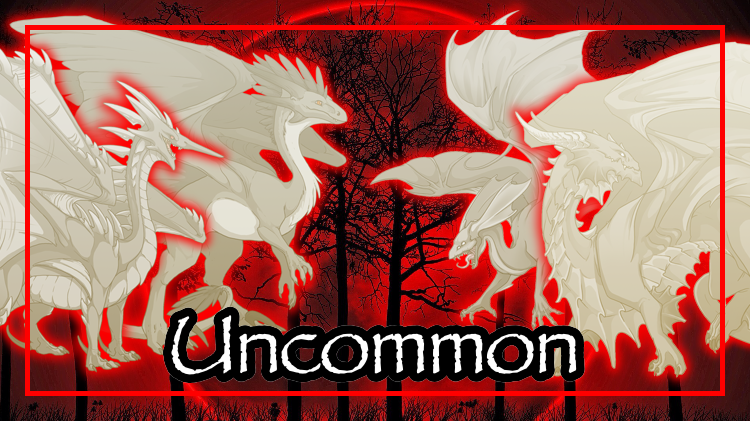 Common, Uncommon, Unusual, & Rare: Ghouls with these eye types have no special abilities. Faceted: These Ghouls tend to have difficulty seeing in their juvenile years. As they mature, their faceted eyes are used to catch the smallest movement. Multi-Gaze: Ghouls with multi-gaze are able to see in a full 360 view if they so choose. However, it is quite difficult to maneuver when you can hit your eye with the slightest shift. These Ghouls will often wear armor to protect the extra eyes. Primal: Primal Ghouls are more connected to their element than normal Ghouls. They can tap into the pure power of their element, and are often more likely to harvest fear from dragons of the same flight. Glowing: Ghouls with glowing eyes are often more intelligent than other Ghouls. Their fear factor is increased, and they are capable of building traps for their prey. If the title says closed, then I'm busy and am not accepting registrations. If it says open, then it's safe to register. To register a Ghoul, simply copy, paste, and complete the form below. PM me with any questions about registration! Click the button above to go to the Sales thread! There, you can sell and/or trade Ghouls! Want to be more involved with the Ghoul community? Why not write some lore, make a raffle, or start a roleplay? If you have something special that you'd like to share with the community, PM me a link to it with the subject "Ghouls" and I'll put it here!